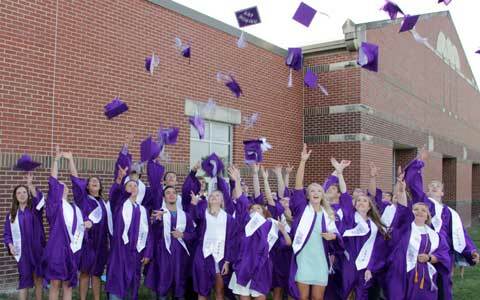 The 2018 graduates of Burlingame High School toss their hats in celebration. Photo by Keri Welch. Attending graduation ceremonies at Burlingame High School is almost like hanging out with your family, as pointed out by the 2018 salutatorian Fallon Tyson. 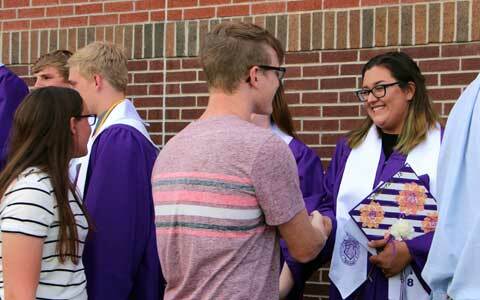 Tyson joined with her two fellow valedictorians, Dalton Sporing and Tristan Lee, in good conversation and good company as they gathered with graduates and their families and well wishers, Saturday afternoon, May 12, 2018, at the elementary school gymnasium. In her salutatorian speech, Tyson pointed out how her school family and good memories developed over the years. She spoke about the fun and enjoyment of school, along with personal stories that each student collected over the years. In his speech, Lee warned about the struggles his classmates would face as they reached for success. He also cautioned about accepting misconceptions about success. “The common misconception that success is determined on what you get not what you give is just wrong. True life meaning comes from contributing to a cause that matters to you,” Lee said. “Now I am not saying to give everything and don’t get anything. I am saying give more than you get. He noted poor attitude and procrastination caused some students to struggle, and he advised that everyone should determine their own outlook on life. He also advised his classmates to not let fear control their lives. “I have always been told that to fear failure is to fear life itself,” he said. “Classmates, we must embrace the failure in life rather than shy away from it,” noting his knee injuries that took him away from playing sports. After the speeches, BHS Principal Tammy Baird presented the class and USD 454 Board of Education President Kris Kline accepted the class for graduation. Members of the USD 454 Board of Education presented diplomas to the following Burlingame High School class of 2018 graduates: Cody Atchison, Caitlyn Bowman, Dillyn Brown, Joao Caldas, Trevor Casta, Selena Contreras, Dylan Gatewood, Timothy Griffin, Jenna Haigis, Levi Hamner, Kirah Herman, Zachary Herrick, Raymond Hovestadt, Kristen Kline, Tristan Lee, Malorie Love, Kylie Masters, Caiden Musick, Colton Noonan, Allison Punches, Linda Ricley, Sunshine Roberts, Sydney Robinson, Dalton Sporing, Holly Swart, Jacob Thompson, Fallon Tyson, Jacob White, and Kaitlyn Zabokrtsky. Senior class sponsors were Megan Summers and Haley Tyson. Attendants for the commencement ceremony were Morgyn Heyne, Paylon Strohm, Montana Giffin, and Seth Greenwood. Lucas Masters congratulates 2018 BHS graduate Selena Contreras. Photo thanks to Keri Welch.